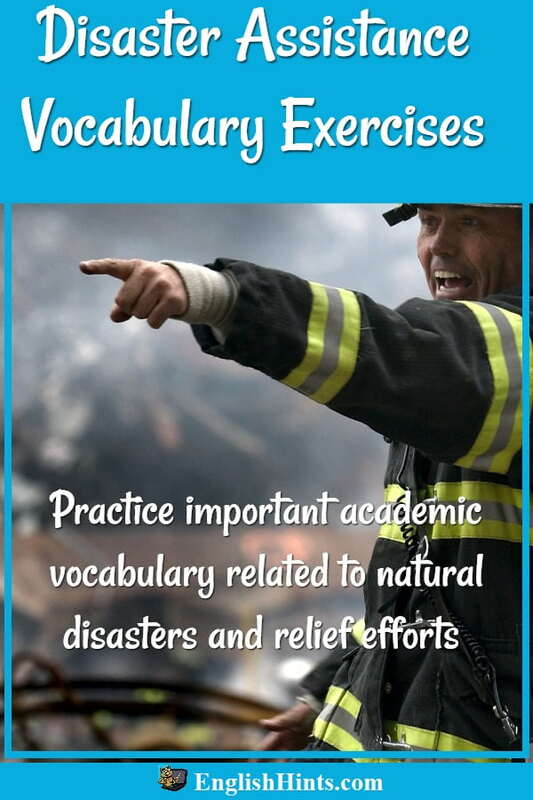 Use these disaster-assistance vocabulary exercises to practice important academic vocabulary. (Most of it is from issue 14 of English Detective. (Toward a World without Hunger) and this TED talk on ending hunger. These fill-in exercises also review important words from previous issues. Type the words above the exercises (and in the illustration below them) to fill in the blanks of this discussion. The first section has been done as an example (with separate vocabulary.). You can get a hint for the first letter of a word if you need help. Be sure to check your spelling, as misspelled words are marked wrong. If you prefer to download and work from a pdf, right click this pdf version. For more practice, see the NPR article, crossword, and quiz at the bottom of this page. We need a straightforward, realistic, approach to natural disasters. Cycles of drought and floods, earthquakes, hurricanes, and tornadoes are recurrent events in various parts of the world. We cannot prevent them, or predict the exact times they will occur, but we can prevent much suffering by preparing beforehand. Planning, good communication systems, and well-maintained roads and other infrastructure can facilitate the delivery of relief supplies and save lives during the crisis. Once the worst effects of the disaster are past, recovery and restoration can begin. It’s also important to take time for an objective evaluation of the mistakes and successes of the relief effort. Recognizing the inadequacies of past relief efforts can save lives in the future-- because we know disaster will strike again. You can find more information about some of these words (as well as links to interesting talks that use them and a quiz to check your understanding of them) in English Detective 14, "A World Without Hunger?" in the back issues section. You might also want to try the Conservation Terminology Gapfiill or Climate Change and Weather Vocabulary. Home> TOEFL & IELTS Vocabulary> Disaster Assistance Vocabulary Exercises. 1 Voice of America articles May 13, 2013, Aug. 9, 2012, and Jan. 31,2012.